Our Holiday Mini Sessions 2017 event will be our last special event of the year! The holiday mini sessions are for ages 2 months through 10 years old and are offered for children only. Each session time includes up to 3 children. There will be an additional $15 fee for each additional child. Please note that the children MUST be in your immediate family and not extended family (no cousins or friends for this event–siblings only). The backdrop is on the smaller side so it will be difficult to accommodate several older children. 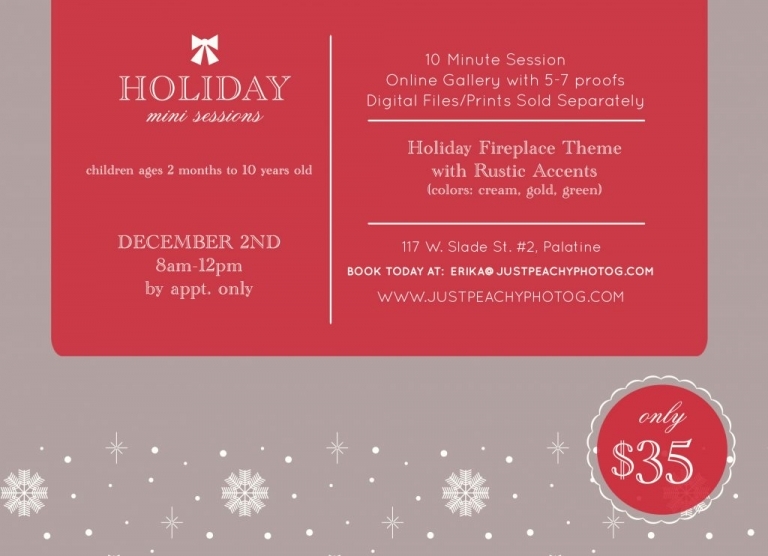 Holiday Mini Sessions are taking place in our downtown Palatine studio, on Saturday, December 2nd in the morning only. The background this year will be a holiday fireplace with rustic accessories. The colors will be cream, gold and dark green mainly. It will have a holiday theme but not be Christmas-y. Our holiday mini sessions will ONLY be offered on this day. Our Holiday Mini Sessions are $35 and include a 10 minute session with our holiday fireplace set up. Digital files and print packages will start at $25. Please contact me for a full pricing list for this special event. You do not have to choose your package until after you receive your proofs but please note the minimum amount you will spend for this event is $25 (after your session fee is paid). In order to book your session, you must sign a portrait agreement and provide a $35 payment. Your space is not officially booked until these 2 items have been received by Just Peachy Photography (you will have 48 hours to return payment and portrait agreement due to limited availability). Proofs will be sent to all participants within 3-4 days of the event so that you can receive your images in a timely manner. I will send a timeline for orders to be received by Christmas as well. All families that book their session before November 25th, 2017, will receive a small gift for each child participating at their session! OR 847-302-1783 for more details! UPDATE: We will have this holiday set up available before and after this event starting on Wednesday, November 29th by appointment only. This will only be available with our regular petite session pricing with a minimum of $275 purchase (for one child) or $300 (for up to 5). If you can find at least 3 families interested in this event, we can set up a short mini session schedule on Sunday, December 3rd in the morning as well. Click on the graphic below to book your session! Here are some favorites from last year! Contact me with any questions or to book your session now!